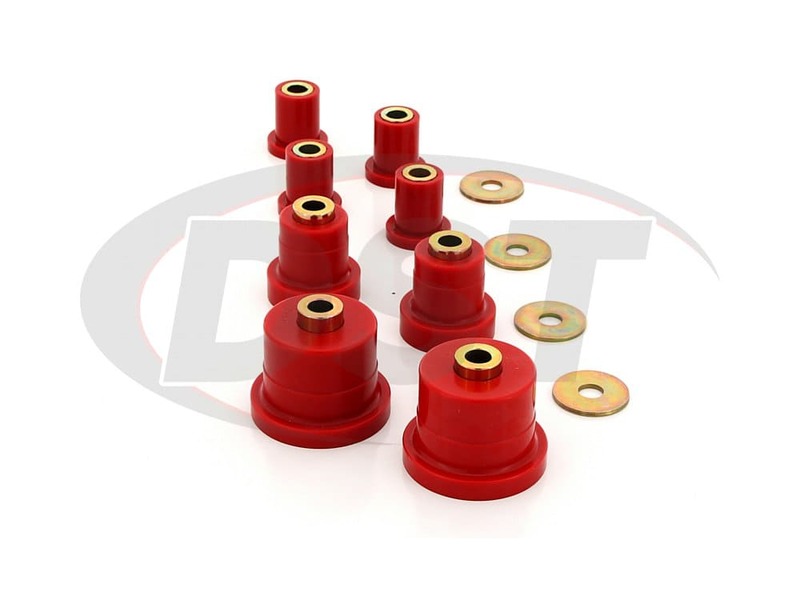 These Polyurethane Front Control Arm Bushings from Prothane will replace the original rubber bushings in your '02-'09 Chevy Trailblazer or GMC Envoy. 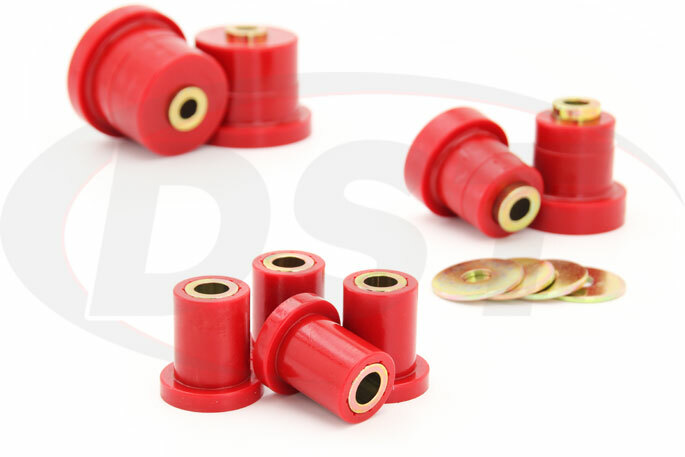 Firmer polyurethane bushings will hold wheel alignment much longer than rubber and will last the life of your vehicle. Your Chevy Trailblazer should be able to live up to its name, but the rubber bushings that hold the control arms to the frame have a lot of give and allow the alignment of your front wheels to shift. 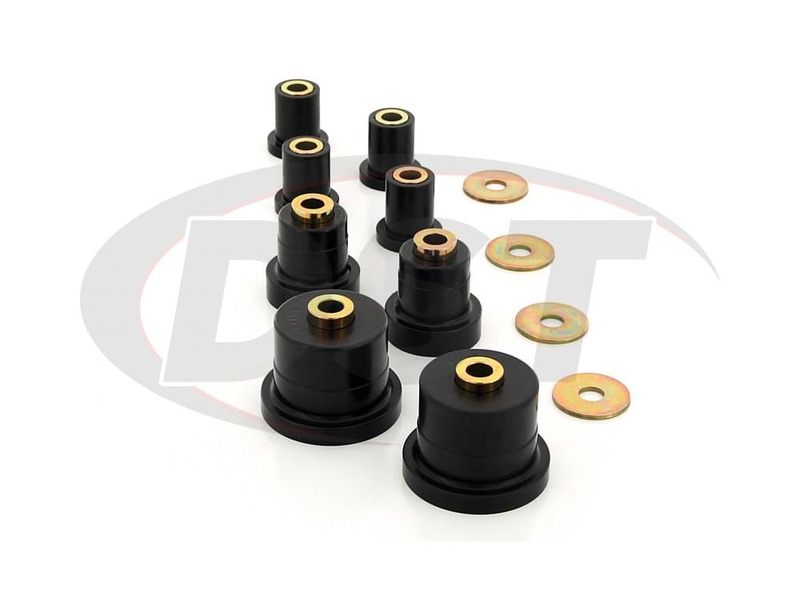 The original bushings that flex to absorb road noise and vibration do not hold up well against the stress and elements that are natural for a vehicle that sometimes operates off-road. Even if you keep your GMC Envoy on level ground eventually rubber is going to degrade and wear down to the point that having your front end realigned will become a frequent occurrence. The camber of your Trailblazer's front tires is important for steering, traction, and tire-wear and the control arm bushings play a big part in keeping that alignment angle steady. During a turn, pressure is put on those bushings and rubber stretches and bends which allows the wheel to tilt to the outside of the turn. This costs you traction and can wear your tire down unevenly. 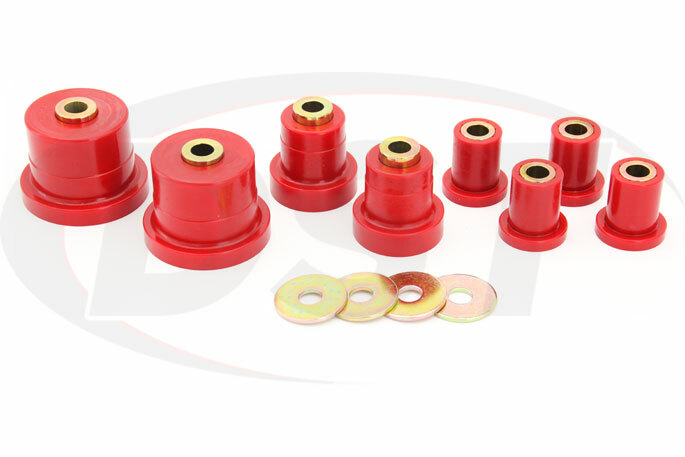 If you want to strengthen that weak spot in your Trailblazer or Envoy's suspension then you should take a look at Prothane's Polyurethane Front Control Arm Bushings. The polyurethane in these bushings is a harder material than rubber and does a much better job of holding your front end in alignment. Urethane has come a long way since it was first introduced and lower durometers for weight-holding suspension bushings allow for a smoother ride than those first generation poly bushings. Polyurethane does not degrade like rubber when constantly exposed to weather, heat, road salt, or oils. So whether you spend months at a time with chains on your tires or you deal with pavement-boiling heat as we do in Stephenville Texas these bushings will still be holding your control arms in place. 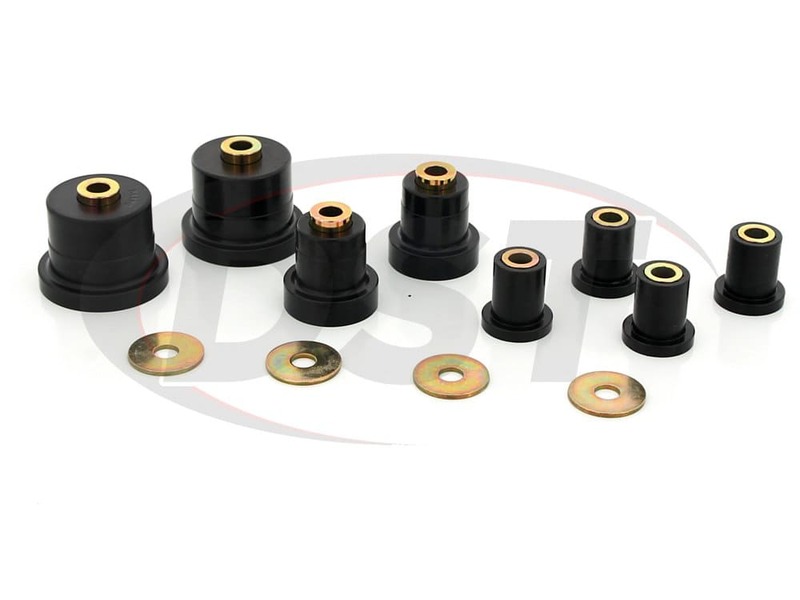 If you're original front control arm bushings are in sad shape then it's a good bet that your rear bushings are in the same state or close to it. 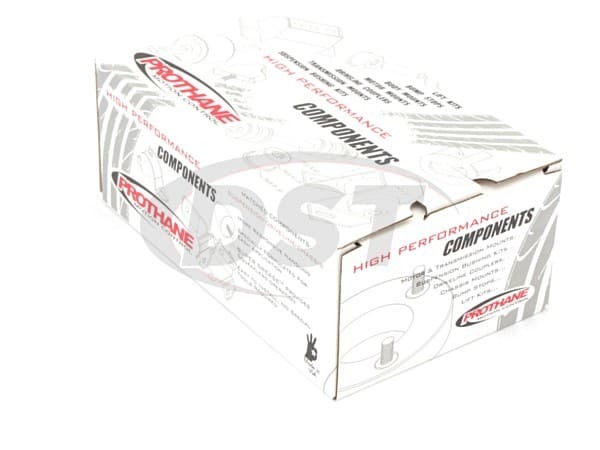 Luckily Prothane also covers the rear control arms of the Trailblazer, Envoy, or Rainier with a polyurethane rear control arm bushing kit that will completely replace degraded rubber bushings. This will help the entire contact patch of those rear tires recieve the power from your engine instead of wearing down the edges. 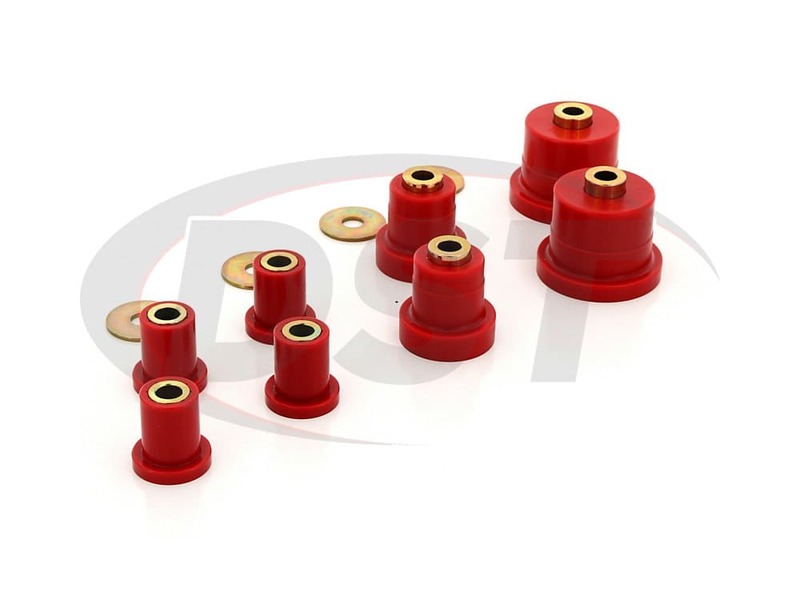 Like the front bushings, Prothane backs up these, and all of their suspension bushings, with a Lifetime Warranty. Fit was spot on. They were a PAIN to install... (vehicles fault.) used the grease Properly .... AND..... They SQUEAK! Sigh, The life of Poly Bushings. Not my first rodeo with poly....... Still will buy more.Editors Note: It is very important to use the proper grease and coat the bushing with grease everywhere the bushing comes into contact with metal. Prothane Super Grease is recommended for their bushings. Do not use chassis grease as this deteriorate the poly urethane over time. I decided to replace the bushings in my new control arm brackets with these for a little more rigidity. They deliver as to be expected with polyurethane.  These Installled relatively easy. though it would be best to have a high quality ball joint press for removing the old bushings and aiding in installing the new bushings. I did not use the uppers as I do not run factory upper control arms though they are of the same quality and install the same way. Do the Prothane bushings come with the metal inserts? I have not been able to find any information on them. Depending on the bushings, some have the metal sleeve insert and some do not, most kits will advise if you need to save your current sleeves or not. Will kit number 7242 come with both left and right bushings? The kit number 7242 include both left and right side bushings, upper and lower, for your front control arm bushings. For part number 7242, do I need to reuse the outer shell on both the upper and lower bushings or just the uppers? On the bushings in kit number 7242, you will need to reuse the outer shells for both the upper and lower control arms. Will part number 7242 fit my 2003 Chevy trailblazer 4wd? Also, will this kit do both the left and right side? Yes, part number 7242 will fit the 2003 Chevy trailblazer 4wd and will do both the left and right sides. Does part number 7242 cover both the left and right sides? Yes, part number 7242 covers both the left and right sides.